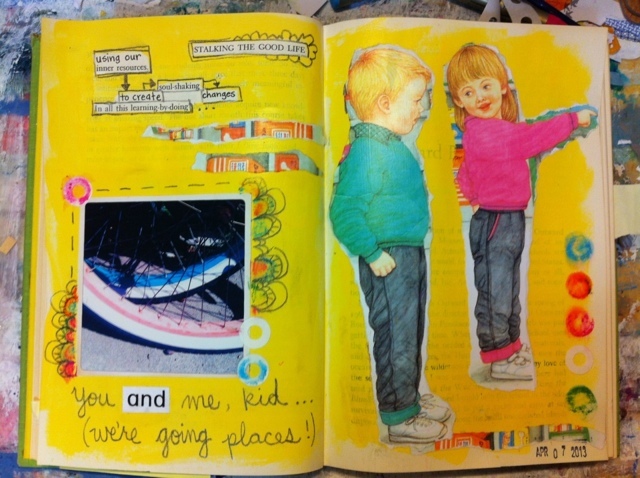 acrylic, water soluble oil pastels, vintage children's book images, scrap paper, and original photo. "Stalking the Good Life: using our inner resources to create soul-shaking changes in all this learning by doing." I consider myself pretty lucky to live with my greatest hero. It's been especially awesome watching him grow into his own skin over the past few years. I'm so proud of my husband. He is not only fine tuning his talents and developing his craft, he is learning to get out of his own way and to create his life around his passions- guitar building and music. It's such an inspiration to witness his creative process. He's teaching me (without even realizing it) to work through resistance and develop the right attitude about doing work that I love. He has many creative projects in the works and I get so much joy from seeing his excitement when he gets his next brilliant idea. Most recently, he's been working on his first electric guitar (it's incredible!) and is getting ready to enter it into the woodworker's competition at the fair. This weekend, he began a Facebook page for his business, Bowman Built Guitars. Next it will be a website and the sharing of his art with the world. His courage to take control of his creative life and put himself out there inspired my art today. I snapped a photo of these pink and blue beach cruisers on one of my walks because they reminded me of us. The spread began with the photo and perfect found text, and developed from there. We are kids at heart, always looking for our next adventure. I love that our creative journeys are evolving so synchronistically. We are on parallel paths, that crazy kid and I.